Cream butter and shortening. Gradually add sugar, beating well. Add egg yolks, one at a time, beating well after each addition. Combine flour, soda and salt; add to creamed mixture alternately with buttermilk, beginning and ending with flour mixture. Mix well after each addition. Stir in vanilla, coconut and 1 cup chopped nuts. Beat egg whites (at room temperature) until stiff peaks from. Gently fold into batter. Pour batter into 3 greased and floured 9 inch round cake pans. Bake at 325 degrees for 35 minutes (or until wooden pick comes out clean). Remove layers from pans and let cool completely. Frost with Italian Cream Cake Icing and sprinkle with remaining 1/2 cup nuts. Cream butter and cream cheese. Blend in powdered sugar. Add vanilla and brandy. Frost Italian Cream Cake top and sides. 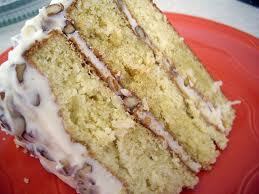 Sprinkle remaining nuts over top of frosted Italian cream cake...Mama mia !